I'm often asked what the process is for waxing a wheel of cheese. * My technique is decidedly low-tech. I've basically set up a double-boiler to do the job. Using a small pot I picked up from Ross Dress for Less (no way was I going to destroy my Calphalon! ), I boil about 2" of water, placing a steel can (originally from some canned veggies) right into the water. I then melt a few chunks of cheese wax in the can. The goal is to bring the wax up to as high a temperature as possible--that way when it makes contact with the cheese it will kill any bacteria or mold that's currently on the cheese, and simultaneously seal the cheese. The key is to brush the wax on in many layers--otherwise it'll be too thick and will end up just being mushy as you try to hold the cheese. Then just continue painting on the wax, until you've got a nice, even shell--making absolutely sure not to leave any air holes! Another technique, which I haven't tried yet, is to heat up a larger quantity of wax, and then simply dip the cheese into the wax (half at a time). You've got to be careful, though, as the wax is very slippery! Best to dip one side, let it cool, and then dip the other, let it cool a bit, and alternate a few times until you've gotten a nice buildup of wax. - Make sure you use a natural fiber brush. Nylon bristles will melt! - Set up some wax paper on your counters -- as you're working, it'll make a mess (see above pic! ), and you can safely set the cheese down for a moment without worrying about it becoming glued to your workspace. - Chill the cheese first! This will help the wax cool quickly on the cheese, making it much easier and faster to complete this process. - The leftover wax can stay in the can. Just let it cool, and cover with some saran wrap or some such. That way next time you'll be ready to just drop it straight into the hot water. - Never heat wax by direct flame. It's flammable (and so are the vapors). Don't leave it unattended, either! Keep some air moving in your kitchen and you'll be just fine. - You can re-use the wax. Melt it down and strain it through butter muslin. Messy, but cost-effective. * That's a lie. I've never been asked. I'm gunna tell you anyway, though. I've read bits and pieces online but haven't found a place that gives me concrete answers on where to store cheese and how long it will last. I've read 25 years? Can I just buy storeboght chunks ad store them on the shelf after waxing? or do they have to be in the fridge? I'm looking for answers regarding my food storage. I couldn't live without cheese! Any help would be awesome. Thanks! The two enemies are mold and humidity. Too much exposure to air and unwanted molds will grow on/into your cheeses (this is why we wax the cheese). Too little humidity and the cheese will dry out. Too much humidity can be a problem as well. Temperature is important because it helps inhibit mold growth. Most cheeses age best around 50-55 degrees Fahrenheit. I believe a good target humidity is about 80-85%, but it depends on the cheese. (These numbers would be good for a cheddar, not so much for a blue). To high a temp and you'll have mold problems. Too low a temp and you will halt the aging process. I wouldn't store my cheeses at room temperature for more than a day or two--you'll have too many mold problems. If I know I'll need to keep a cheese around for more than a couple of weeks (and I've already opened it), I'll vacuum seal it with my food saver. It's a cheap, easy way to keep the cheese safe. Since the vacuum seal is a total barrier to air, I think it slows down the aging process a tad (wax breathes just a little bit). By the way, I've enjoyed a cheddar that was aged 10 years. If memory serves, it came from a small family operation in Wisconsin. So yes, it's definitely possible to age cheeses for that long. (It's very rare to find a cheddar aged longer than around 4 years, however!). Hey there--I just found your blog and I am loving it! I am just getting started with simple cheeses and have found a nearby source for fresh goat's milk. I am really enjoying learning about what others do and am happy to see so many people sharing the cheesemaking love! I'm so glad your blog is here. Glad you're enjoying my blog! I hope you continue to find it fun/useful/interesting. I'm very jealous that you have a local supplier for Goat's milk. I buy mine from Trader Joe's, at a rather steep $2.99/quart. It's convenient, but sure gets expensive quick! Please keep me posted on your adventures! One of your friends directed me to your blog. I am fairly new to cheesemaking, but have had some wonderful results so far, particular with the chevre. I also use the TJs goats milk and add different fresh herbs/subdried tomatoes/etc to the finished product to make individual crotins look a little more impressive at parties. I love the fact you can have something ready for a party with just 48 hours notice. You have some great ideas on here, and have insired me to give waxing a go for the first this weekend weekend! I'll be checking for new postings. I definitely need to give a classic Chevre a try... I jumped in headfirst and went for mostly hard cheeses, and I think I should give some of the softer--and faster--cheeses a go. Thanks for the nudge on that. Waxing is surprisingly easy. Just be patient and make sure you heat the wax high enough to sterilize it (190F should be plenty). Use a double-boiler of some kind--don't heat it directly. Also, wax fumes are flammable, so make sure you're in a reasonably ventilated area (though we're not talking about huge quantities here, but just in case...). I find that placing a couple of sheets of wax paper on my countertop makes the cleanup much easier, too. The mutual friend is Dave McAlister, one of my colleagues. Very brave of you to go straight for the hard cheeses! I am far too impatient, especially after hearing from another cheesemaker she spend 3 months waiting for a cheese to mature but somehow there had been some bacterial contamination and it just didn't taste right. Anyway, I sent you some of my newbie cheesemaking photos to the address linked to from this website yesterday, so check your spam folder if you didn't spot them. Hi- I am elated to find this blog, I started making cheese from my goat's milk last summer. I jumped into hard cheeses and have learned by trial and error. I'm using beeswax but didn't realize I had to get it so hot.. I've had mold issues under the wax. I also have trouble cutting the curds a consistent size. I have some cheeses that you don't wax (parmesan) and I'm having a heck of a time wiping the mold off daily. It's in crevices of the cheese and I just can't get it all off. I have a million questions, I am so happy to find this site! Glad you like my blog - I definitely hope you find it useful! I'm definitely not an expert, as I'm still figuring all of this out for myself as well, but I'm happy to try to help. I'm also jealous that you have your own supply of goat's milk. Trader Joes charges $3 a quart, so that gets expensive fast! Heating the wax to high temps is definitely important because (1) it sterilizes the wax and (2) will kill anything that's on the surface of the cheese as you apply it. That second part is probably where you were encountering problems. I haven't tried Parm yet, but I do wonder--is it horrible to let some mold grow on the outside? I know there are some "wrapped" cheeses (wrapped in strips of cheesecloth), where you actually encourage a rind of mold. Once the mold grows to a certain point, it ends up encasing the cheese and sealing it off. Of course, you don't want it getting INTO the cheese beyond the surface. I live in Asia and a company here is offering different kinds of bee wax. Is there any advantage is getting high or low acid beeswax? The wax I've been using is a blend of paraffin and microcrystalline wax. They also mention that pure paraffin wax becomes too brittle. Not sure how beeswax will differ. Obviously you'll want to be sure it's sterilized, but beyond that I don't have much good advice to give. Please let me know if you find out anything else! Chris- thanks for your response about beeswax for cheese. I have since determined that if you heat it hot enough (200 F) it works just fine! I wasn't letting it get that hot. I am not doing this on an open flame, rather I am using a griddle surface so I think (hope)I am safer. the high temp and I hold the cheese in the wax and count six seconds..I think that kills any mold on the cheese surface and any bacteria in the wax itself. someone else commented on types of beeswax...high or low acidity.. which I know nothing about! Hi! I just came across your blog today, and I was wondering if waxing cheese with paraffin wax is safe, or do you need to use special cheese wax? I believe as long as it's "food grade" wax, it should work. However, it may just be a matter of how well it works. New England Cheesemaking Supply's "Cheese Wax" is a combination of Paraffin and Microcrystalline Wax... they claim it stays more pliable. I wonder if straight paraffin would become too brittle and end up cracking in the cool temps of the cave? Whatever you end up using, make sure you heat it up to at least 180F before applying, to make sure it's sterile. (And that should kill any bacteria on the surface of the cheese as you apply it, too--so it needs to be that hot when you apply it). On a trip to Holland in October I bought my mom a waxed cheese wheel of Gouda cheese. I kept the cheese in the bag and in my cupboard for about 3 months since that is when I would be able to finally give her the cheese as a gift. When I opened it recently there is mold growth just on the bottom of the cheese wheel, is the cheese inside still safe to eat? Thanks! What a wonderful gift for your mother! As long as the mold is just on the surface, you can simply cut it off and eat the rest. (If the mold had grown throughout, the cheese would be lost). 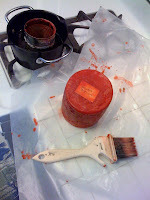 Now that it's open, throw out the rest of the wax and put the cheese in an air-tight container in the refrigerator. It should last several more weeks that way. (If any more surface mold returns, just cut it off). If you had put the cheese in the fridge when you got back from your trip, it might not have had this mold issue -- but then again, it's probably a bit more flavorful having been aged an additional three months at room temperature! my advice regarding mold under the wax: scape it off until the cheese looks normal and taste the cheese!!!!!!! if it's good, then it is. If you still have concerns, then use the cheese for cooking purposes. I've used Olive Oil once (for Manchego), and it worked well. Unless it's completely submerged in oil, you're still likely to get at least *some* mold growth. Ash is indeed another good option -- as long as it's food-grade ash! Ideally, anything that will keep air out -- but still "breathe" a tiny bit will work well. Ash is also a natural mold inhibitor, so that's one of the reasons it works well. Paper might be helpful, especially in conjunction with the ash. Otherwise, it'll still let too much air in, and allow for mold growth. Hope that helps, and let us know how you go! I found a lot of useful information here. However, I don't know how I can clean my brush after waxing? I don't want to buy a new one each time. Thanks for your answer!